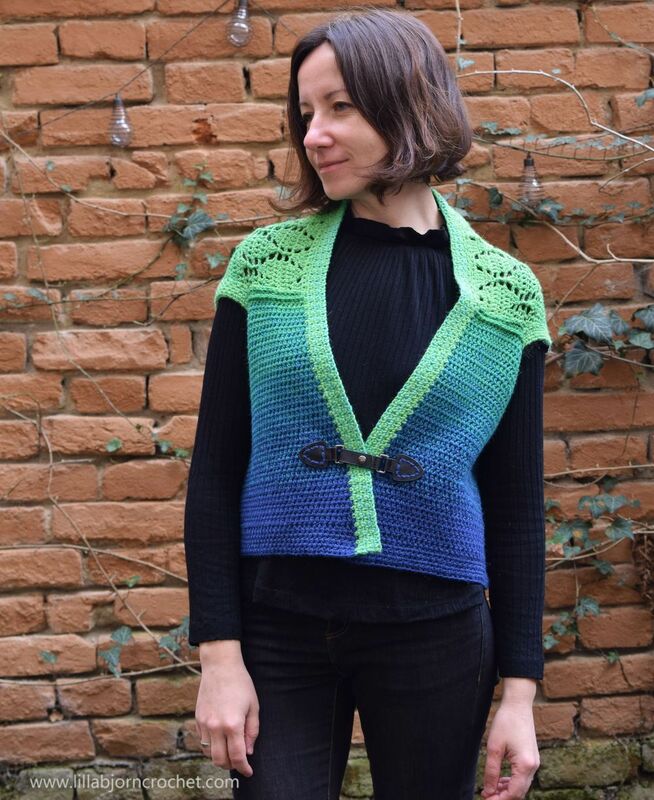 Spring Leaves Shrug is a small crocheted garment aimed to advanced beginners. It is designed as a little bit oversized and cropped. Perfect for dresses and skirts. But the length is easily adjustable. 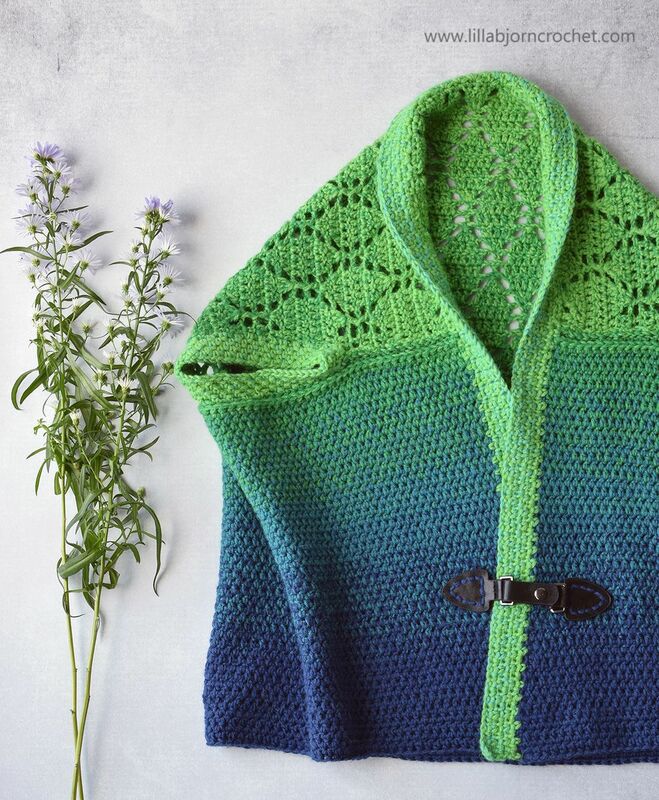 The free crochet pattern is also available in Dutch (check link below). Enjoy! Purchase ads free ready-to-print pdf with full written instructions and photo-tutorial HERE on Ravelry. 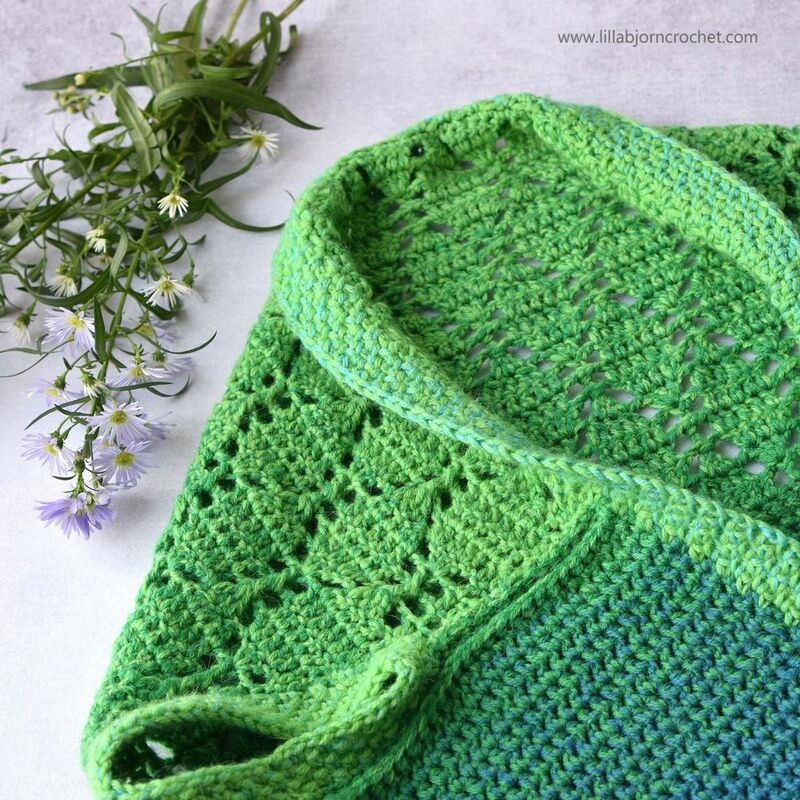 Spring Leaves Shrug is crocheted from bottom to top in one piece. Then two seams are made to shape the shrug. Narrow armholes borders and front band are added to finish. Ch2 in the beg of every row doesn’t counts as a st. First st of every row is made in last st of previous row. BPdc back post double crochet: yo, insert hook from back to front to back around the post of indicated stitch, yo, draw up a loop, [yo, pull through 2 loops] twice. dc double crochet: yo, insert hook in indicated st, yo, draw up a loop, [yo, pull through 2 loops] twice. dc3tog double crochet 3 together: [yo, insert hook in next st, yo, draw up a loop, yo, pull through 2 loops] 3 times, yo, pull through all 4 loops on hook. FPdc front post double crochet: yo, insert hook from front to back to front around the post of indicated stitch, yo, draw up a loop, [yo, pull through 2 loops] twice. hdc half double crochet: yo, insert hook under three loops (between the stitches), yo, draw up a loop, yo, pull through all three loops. 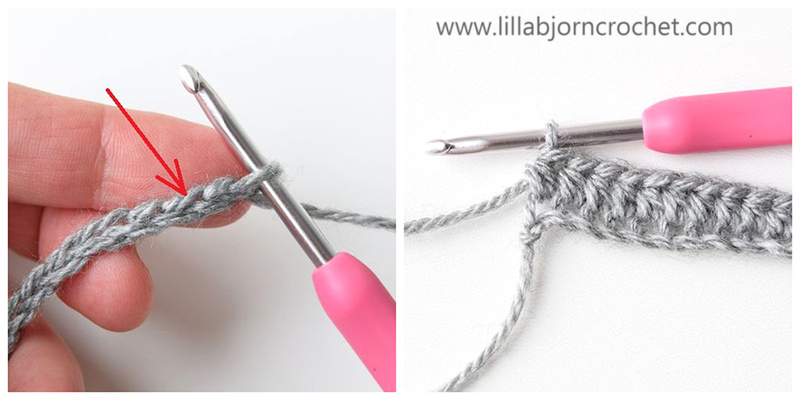 sc single crochet: insert hook in indicated st, yo, draw up a loop, yo, pull through 2 loops. ss slip stitch: insert hook in indicated st, yo, draw yarn up and pull second lp through first loop on hook. An original LillaBjörnCrochet Design (Tatsiana Kupryianchyk). Copyright 2014-2019. All rights reserved. This pattern is for personal use only. It cannot be sold, redistributed or edited in any way. Translations and video-tutorials are NOT allowed without permission. You can sell your finished products, but you cannot use my pictures to promote them. Please, always credit me as a designer of this pattern. Thank you! Begin with Whirligig yarn. 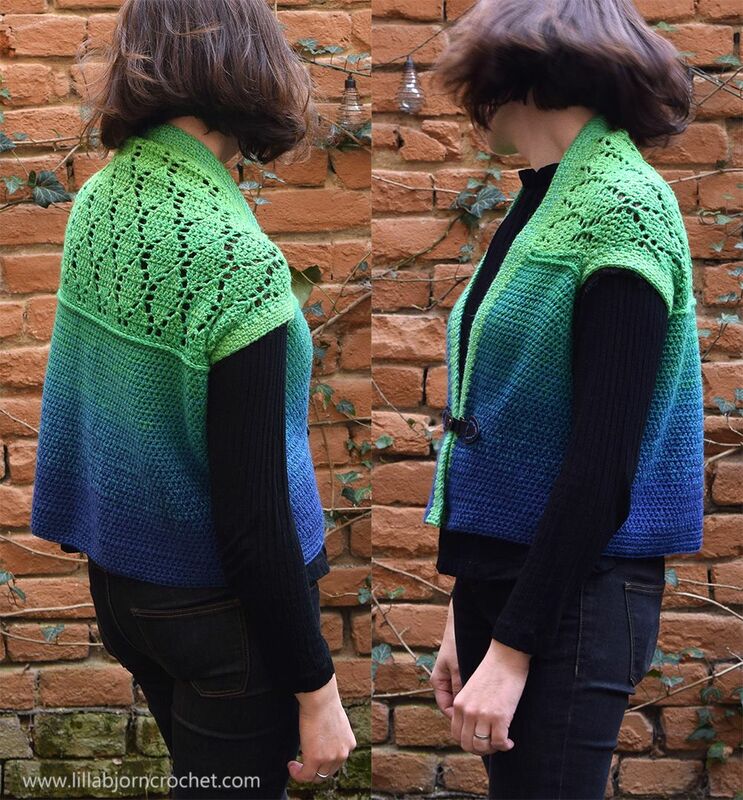 For large sizes you can either begin with matching Whirligigette and then continue with Whirligig for a continuous gradient. 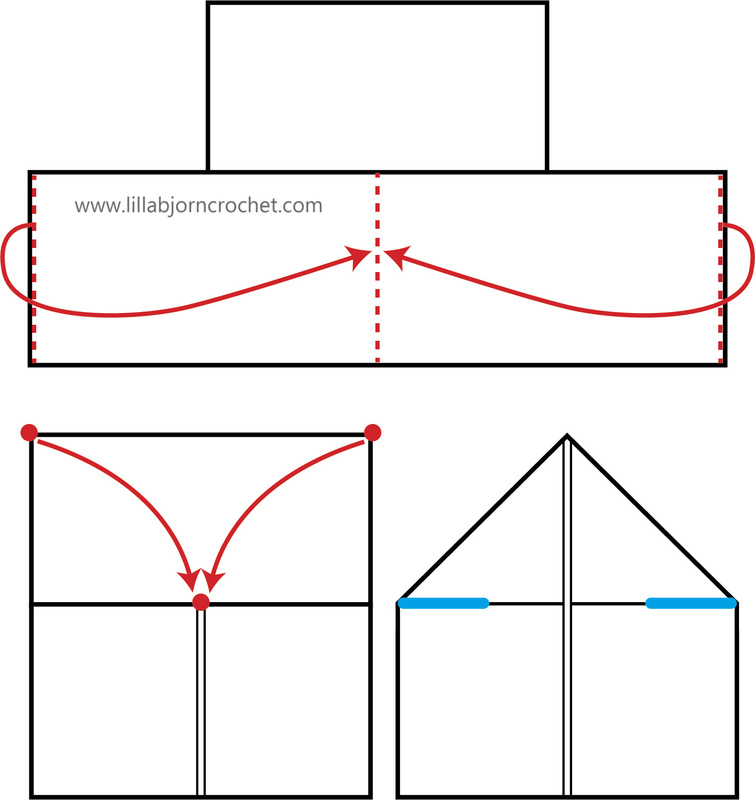 Or you can begin with Whirligig and join matching Whirligigette on top panel and for armhole borders and front band. Repeat row 2 until Bottom Panel measures 31 (30.5, 29.5, 28.5, 27) cm/ 12.5 (12, 11.5, 11, 10.5) in. Next row – WS. Ch2, FPdc around each st to end, fasten off. Row 1 - RS. Skip 36 (39, 42, 48, 51) sts. With 4.5mm hook attach yarn on RS (ridge will be facing you) in 37th (40th, 43rd, 49th, 51st) st, ch2 (doesn’t count as a st), dc in same st, dc in next st, [ch2, skip 1 st, 1dc in next st, ch2, skip 1 st, dc in next 2 sts, 2dc in next st, 1dc in next st] repeat 9 (10, 11, 12, 14) times, [ch2, skip 1 st, dc in next st] twice, dc in next st, turn. You should have 36 (39, 42, 48, 51) unworked sts left. Insert markers in 23rd (24th, 25th, 27th, 28th) skipped/unworked sts on last row of Bottom Panel measuring from the edges of Top Panel. This should leave 17 (18, 19, 20, 21) cm/ 6.5 (7, 7.5, 8, 8.5) in between markers and edge of the top panel. And 10.5 (12, 14, 17, 18.5) cm/4 (5, 5.5, 6.5, 7.5) in between markers and edges of bottom panel.
! 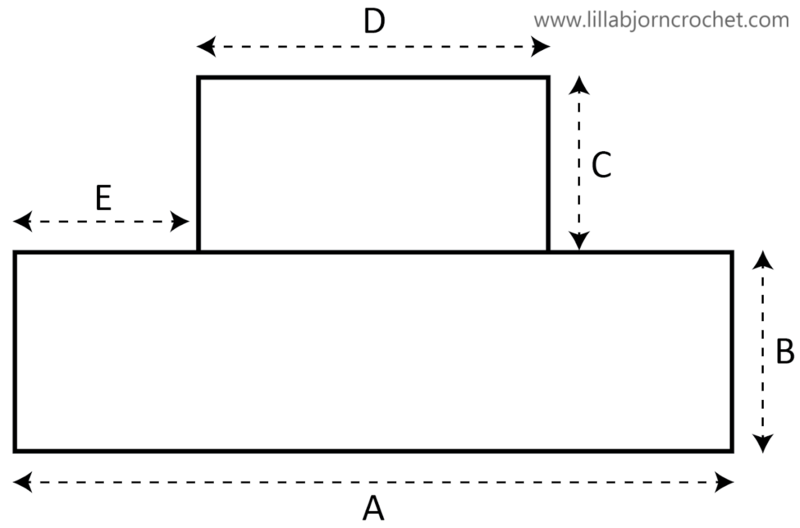 !Gauge check: gauge will change on the top panel. Its width should stay approx. 54 (60, 65, 70, 80.5 cm)/ 21 (23.5, 25.5, 27.5, 32) in throughout. If it becomes much wider, please, make all chains and dc tighter or switch to a smaller hook. Row 2 - WS. Ch2, 2dc, ch1, skip sp, [3dc in next st, ch2, skip next sp, dc2tog over next 2 sts (here and throughout), 1dc, dc2tog, ch2, skip sp] repeat until 3dc and ch2-sp left, 3dc in next dc, ch1, skip sp, 2dc to end, turn. Row 3 – RS. Ch2, 2dc, skip sp, 2dc in next, 1dc, 2dc in next st, [ch2, skip sp, dc3tog over next 3 sts (here and throughout), ch2, skip sp, 2dc in next st, 1dc, 2dc in next st] repeat until 2 sts and ch1-sp left, skip ch1-sp, 2dc to end, turn. Row 4 – WS. Ch2, 7dc, [ch2, skip sp, BPdc around next dc3tog, ch2, skip sp, 5dc] repeat until 2 sts left, 2dc to end, turn. Row 5 – RS. Ch2, 7dc, [ch2, skip sp, FPdc around next st, ch2, skip sp, 5dc] repeat until 2 sts left, 2dc to end, turn. Row 6 – WS. Ch2, 2dc, ch1 (don’t skip sts), dc2tog, 1dc, dc2tog, [ch2, skip sp, 3dc in next st, ch2, skip sp, dc2tog, 1dc, dc2tog] repeat until 2 sts left, ch1 (don’t skip sts), 2dc to end, turn. Row 7 – RS. Ch2, 2dc, ch2, skip sp, dc3tog, [ch2, skip sp, 2dc in next st, 1dc, 2dc in next st, ch2, skip sp, dc3tog] repeat until 2dc and ch1-sp left, ch2, skip sp, 2dc to end, turn. Row 8 – WS. Ch2, 2dc, ch2, skip sp, BPdc around next st, [ch2, skip sp, 5dc, ch2, skip sp, BPdc around next st] repeat until 2 dc and ch2-sp left, ch2, skip sp, 2dc to end, turn. Row 9 – RS. Ch2, 2dc, ch2, skip sp, FPdc around next st, [ch2, skip sp, 5dc, ch2, skip sp, FPdc around next st] repeat until 2dc and ch2-sp left, ch2, skip sp, 2dc to end, turn. Repeat rows 2-9 until top panel measures 27.5 (30, 33, 36, 39.5)cm/ 11 (12, 13, 14, 15.5)in – blocked! Note: Different sizes will need different number of rows. Top panel will not necessarily end with row 9. Next row. Ch1, 1sc in every st and every sp. Fasten off leaving approx. 50cm/20in tail. Place markers along edges of upper panel 17 (18, 19, 20, 21) cm/ 6.5 (7, 7.5, 8, 8.5) in measuring from last row of bottom panel. This should leave 10.5 (12, 14, 17, 18.5) cm/4 (5, 5.5, 6.5, 7.5) in to last row of top panel. Block shrug exactly to the measurements. Place the shrug onto the table with WS facing you and fold both sides of Bottom Panel to front, so that edges meet. Folds should be exactly below the edges of top panel which should stay flat and unfolded. Now fold corners of the top panel diagonally down, so that edge meets unworked sts on the last row of Bottom Panel. Markers on top and bottom panel should meet. Sew bottom and top panels from outer edge down to the markers using tapestry needle. An armhole will be left on each side. With RS facing you, attach yarn in any st of the armhole using 5mm hook. Make ch1 and sc in same st as join. Then make (ch1, skip st, sc in next st) evenly, making sure the fabric doesn’t pull. If needed, frog first round and remake it with more sc and sps between them. When you are satisfied with the stretch of the armhole, don’t join the round and continue working in spiral making sc in every ch1-sp and ch1 over every sc. After 5 rounds, ss in next ch1-sp and fasten off. Repeat for the other armhole. With RS facing you, attach yarn in the corner of Bottom Panel using 5mm hook. Row 1 – RS. Make ch1 and sc in same st as join. Then make (ch1, skip st, sc in next st) evenly ending in another front corner of the Bottom Panel. Make sure the fabric doesn’t pull. If needed, frog first row and remake it with more sc and sps between them. Turn. Row 2 – WS. Ch1, 1sc, 1sc in next sp, [ch1, skip next st, 1sc in next sp] repeat until 1 st left, 1sc in last st, turn. Row 3 – RS. Ch1, 1sc, [ch1, skip next st, 1sc in next sp] repeat until 2 sts left, ch1, skip next st, 1sc in last st, turn. 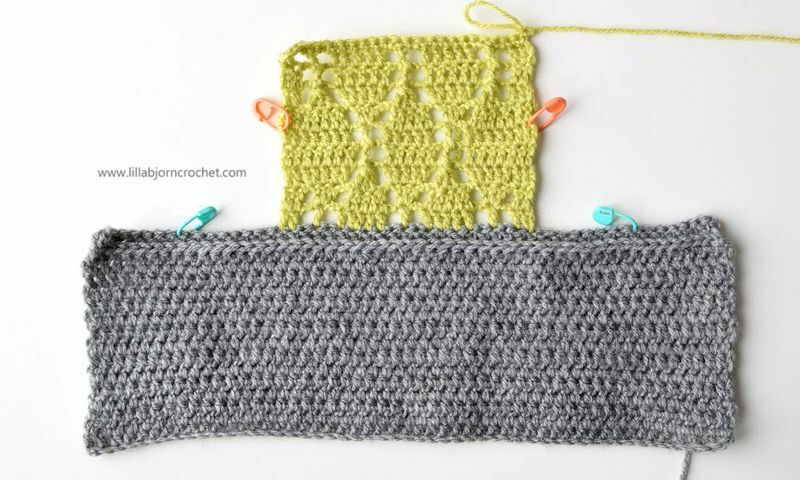 Repeat Rows 2-3 until desired width of the front band. Fasten off. Sew a buckle on the front. Congratulations! 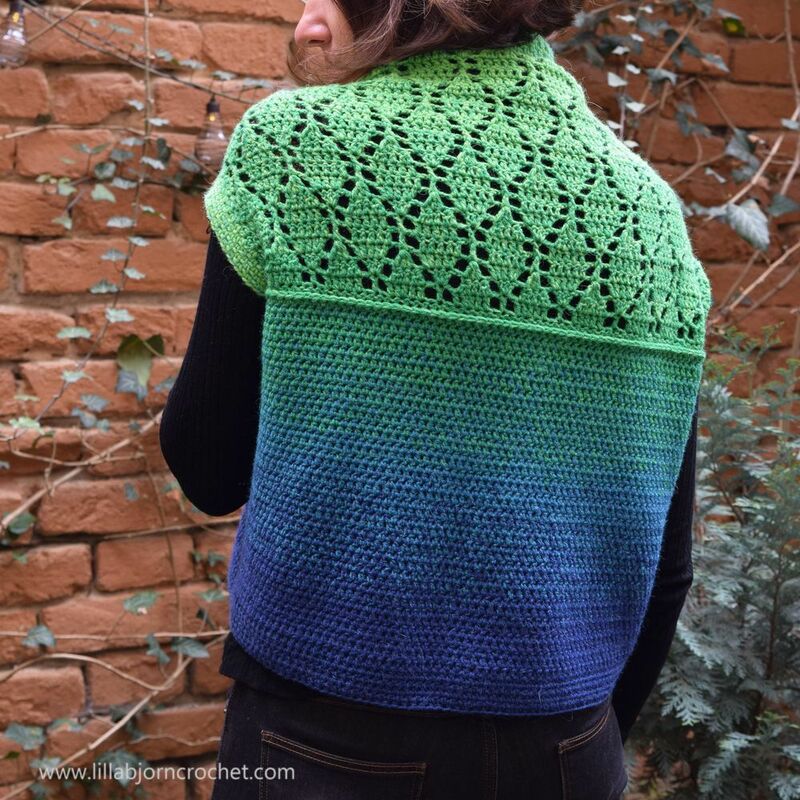 Your Spring Leaves Shrug is now finished! Subscribe to a newsletter not to miss a single post. 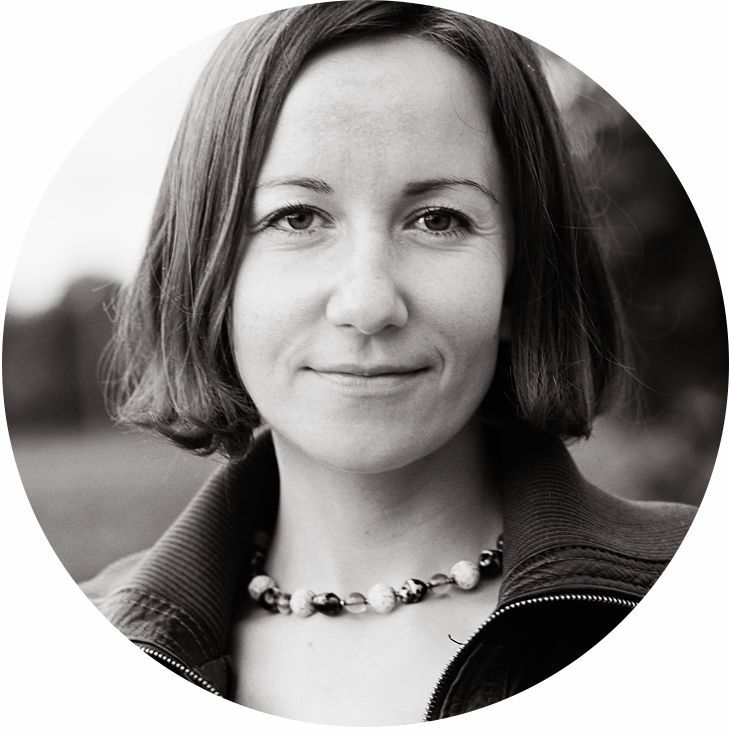 You can also follow me on Facebook, Pinterest and Instagram.